I keep a Pinterest board of good ideas for all the random tidbits I find along the way but occasionally I find something extra simple + clever that is worth a share. 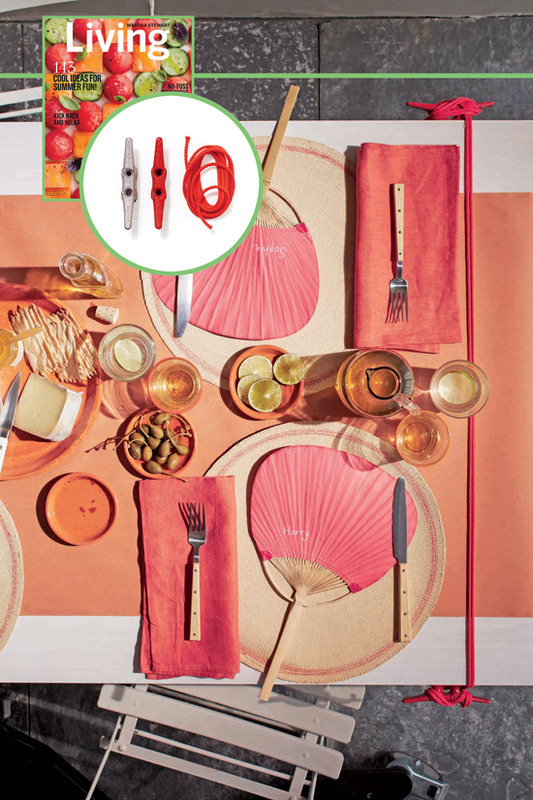 Spotted in the July/August issue of Martha Stewart was this little tip about adding a few window cleats + elastic cord to your picnic table to keep your tablecloth from blowing around. Um, why didn't I think of that? This photo is using a paper roll instead of a tablecloth but it could be easily tweaked to accommodate. Added bonus: napkins can be tucked under the elastic cord to keep those from becoming airborne as well. Genius! Got a good idea to share? Don't be shy - drop me a line. My issue just came in a few days ago and I haven't gotten a chance to pick it up. I've used the paper rolls for parties and picnics but never thought of the tie down idea. Paper is the way to go it makes clean up super easy. What a fabulous idea. I love the colors of the cord and cleats. Brilliant! Especially the tip about tucking the napkins under the cord.